Your students are changing. Technology is changing. The idea of the classroom is changing. Now, the way your students learn German is changing as well.In preparation for this edition of Kontakte, we conducted extensive research, employing a wide array of research tools including surveys, focus groups, and ethnographic studies to identify the key goals and challenges of the introductory German course. Not surprisingly, communication and cultural competence are among the top goals of the majority of instructors, who are facing the challenges of fewer contact hours, budget cuts, and new course formats that make these goals difficult to achieve. Engages students in authentic culture and inspires them to communicate with confidence by providing them with the natural contexts they need to develop their language skillsProvides tools for flexibility and easy course administrationAchieves consistent results across the different course formats offered: face-to-face, hybrid, and online. 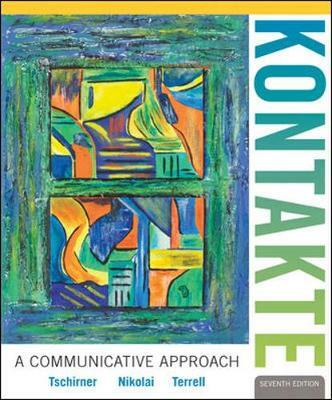 *Connect German, including but not limited to the workbook/lab manual, the video program, and chat tools, is sold separately and does not come automatically with the purchase of the textbook.